Warning: This post is NOT related to any current issue. I was just itching to write a post, and was searching for a topic, when I remembered this topic - a topic that I had planned to write on a long time back. The ubiquitous local trains of Mumbai were once a part and parcel of my life. The last year of graduation (2006-2007) made me fall in love with the sweet sounding DC EMUs of Mumbai, and those F1 like sounding AC-DC BHEL EMUs (not to forget the shwoosh sound that the suspension makes). I've been missing those trains even since I moved to Bangalore (2008). Local trains are an unheard of thing in Bangalore or in Kerala. The only form of local train in Bangalore is a lone MEMU. I moved to Kerala in 2009 - I haven't seen a local train since then. (Except some short trips on a brief visit to Mumbai). The locals in Chennai are a different breed altogether. They run on AC (as compared to DC, during my days in Mumbai). The passenger load is entirely different in Chennai - nobody dares sitting on the floor in a local in Mumbai, for the fear of getting crushed in the super-dense crowds of Mumbai EMUs. During my first ride in a Chennai EMU (in 2009) - I was totally surprised seeing people sitting in the gangway. The trains were more lively - vendors selling various food stuff, people having a gala time in the train. The stations were far apart (I had traveled on the Gummidipoondi route) and the trains were riding at a much higher speed that the ones in Mumbai (average speed). My next date with the Chennai EMU was in January this year (2012). This journey was also on the Gummidipoondi route. The train was fairly crowded, and all the doorways were busy with people squatting on the floor. May 2012 presented another journey in a Chennai EMU - this time heading out to join my new job (I eventually did not join that position). This journey was on the Arakkonam line - stations were closer here. The train was even more crowded, and more people on the floor! I struggled to get off the train - since there were people everywhere on the gangway. Unlike Mumbai trains, there wasn't much co-operation from other passengers to allow me get down. The EMUs in Chennai are much less utilised than the ones in Mumbai. The network is less developed - Southern Railway, as usual, is less passenger friendly as well. 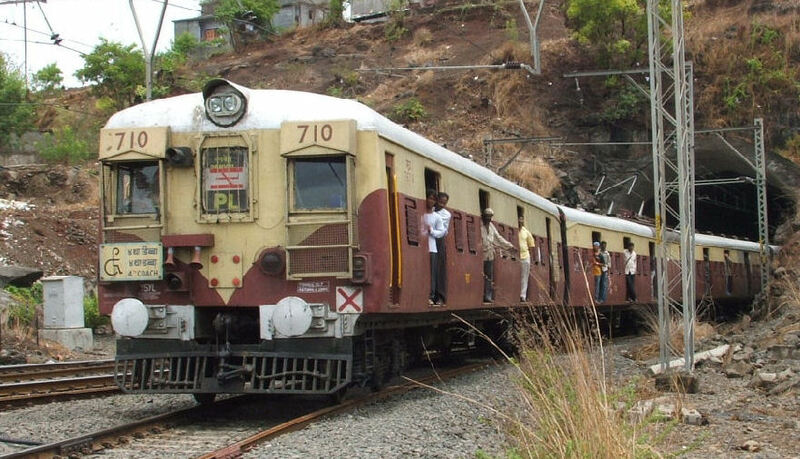 The trains have the same design as the ones in Mumbai - but with a different colour. There are few with the Hyderabad MMTS design as well (reportedly - the trains were built for MMTS, but were rejected by the AP government for some reason). Yeah - I had a short ride on the Hyderabad MMTS as well. That was one short ride - but the train was fairly well crowded. Traffic management on that section wasn't great - which resulted in the EMU waiting for a clear signal outside Secunderabad for quite some time. Kerala got its style of EMUs a few months back - in the form of two MEMUs running in Trivandrum Division (Palakkad division has been operating some MEMUs since some time) - I am yet to try them though. Mumbai local lines now have mostly been converted into AC.